Easter is the most significant Christian holiday because it commemorates the resurrection of Jesus, which is considered the foundation of the Christian faith. It is celebrated by all denominations, including the Armenian Apostolic Church. Easter in Armenia is traditionally called Zatik. The Armenian Apostolic Church is one of the most ancient Christian communities. According to tradition, it originated in the missions of Saint Bartholomew and Saint Judas Thaddaeus in the 1st century. In the early 4th century, the Kingdom of Armenia became the first state to adopt Christianity as its official religion. The church of Armenia is part of Oriental Orthodoxy, alongside the Coptic Orthodox Church of Alexandria, the Syriac Orthodox Church of Antioch, the Malankara Orthodox Syrian Church, the Ethiopian Orthodox Tewahedo Church, and the Eritrean Orthodox Tewahedo Church. Unlike many other Orthodox churches, the Armenian Apostolic Church mainly uses the Gregorian calendar as the liturgical calendar. This means that Easter in Armenia is celebrated on the same day as in most Western countries. Like in the Western churches that use the Gregorian calendar, Armenian Easter is a movable feast that falls on a Sunday between March 22 and April 25 inclusive. The official religious term for the holiday is Harutyan ton, which is translated as “the holiday of resurrection”, but the colloquial term for Easter is Zatik, meaning “ladybug”. The liturgical celebration of Easter in Armenia begins on the night of Holy Saturday with the Paschal Vigil. The principal liturgy is held at Etchmiadzin Cathedral in Vagharshapat since it hosts the headquarters of the Armenian Apostolic Church. Of course, other churches throughout Armenia hold the Easter Vigil as well. Many Armenians are generally non-observant, but they still go to church on Easter, having earned themselves a nickname “Easter Christians”. The faithful greet each other with the words “Christ is risen from the dead”, to which one should respond “Blessed is the resurrection of Christ”. After the service, many people take candles from the church to bless their household with the holy light. 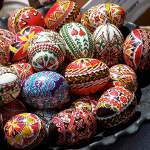 Like many other European ethnic groups, Armenians decorate eggs for Easter. Easter eggs are a symbol of rebirth and the resurrection of Jesus Christ. Traditionally, the eggs should be dyed red because this color is associated with the sun and Jesus’ blood. Easter eggs are often placed in a bed of grass that’s grown specifically for Easter. On Easter and Easter Monday, children and youth play a game known as egg knocking or egg tapping. The goal is to tap and break the egg of another participant without breaking your own. Since Easter marks the end of the seven-week-long Lent, it is customary for Armenians to have a fast-break meal. Traditional dishes served on Easter include pilaf (rice with dried fruit), a variety of greens (some are served raw, others are boiled or cooked with eggs), fish, kutap (a type of stuffed pastry), chorek (sweet bread similar to a brioche bun), and lavash (a soft, thin unleavened flatbread).